Trees cool their environment and "heat islands" like Munich benefit from it. However, the degree of cooling depends greatly on the tree species and the local conditions. 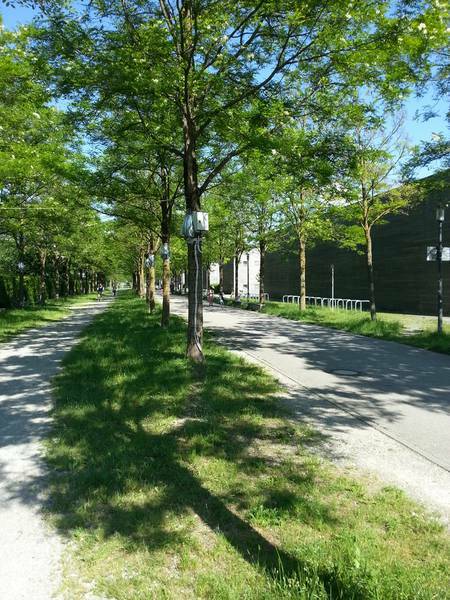 In a recent study, scientists at the Technical University of Munich (TUM) compared two species of urban trees. It is cooler under black locusts, especially on hot summer days. This has significant implications for landscape architecture and urban planning: “Tree species such as the black locust that consume little water can provide a higher cooling effect if they are planted on grass lawns,” Dr. Mohammad Rahman from TUM explained. “The surrounding soil remains moister thanks to the trees, the grass dissipates additional heat through the evaporation of water and thus reduces the temperature near the ground.” This is an important finding obtained by the team led by Humboldt research fellow Rahman. Trees are considered to be nature’s air conditioners, making them the most practical way of alleviating the heat in cities such as Munich. The Bavarian capital is the third-largest and the most densely populated city in Germany. It has an air temperature up to six degrees Celsius warmer than its rural surroundings. A team from the Chair for Strategic Landscape Planning and Management and the Chair of Forest Growth and Yield Science at TUM has now used combined sensor and storage devices (data loggers) to investigate how the microclimate develops below urban treetops in particular. This was carried out on summer days with varying temperatures at different locations in Munich — close to the East Station of Munich and Messestadt Riem. With the little-leaved linden, the 2016 tree of the year, and the black locust — also known as false acacia — they selected two popular but contrasting urban tree species to analyze the complex interplay of location factors, current weather conditions, and tree type. In light of climate change, the focus was on the cooling effect on very hot days. The analysis by the research team becomes clearer by comparison: The output of a mechanical air conditioner is between one and ten kilowatts (kW) that of a linden tree up to 2.3 kW. This cooling capacity is fed by various processes such as the dense treetops that provide shade. Or the fact that the leaf surfaces reflect the short-wave rays of the sun and also use them for transpiration.